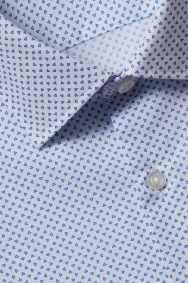 Make your shirt the item that sets you apart. This one by HUGO BOSS will give your outfit personality with its geometric triangle print. As it simply looks textured from afar, it is a sharp choice that will work for business settings. The tailoring is both comfortable and smart as it’s generous through the chest but slightly narrower at the waist. 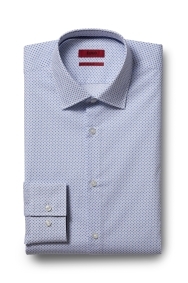 Wear this shirt with a plain bright blue or navy suit and leave it open necked. A pocket square is all you need to smarten your look.